Two of my young friends got married last weekend. Their wedding was much-anticipated, a long time in coming. The bride is from a small town in the mountains of North Carolina, and she wanted to get married at home. Luckily for her, "home" is a beautiful family homesite where her father's family has lived for generations. The weather in North Carolina has been gorgeous lately--sunny and warm, with marvelous blue skies. Last weekend, though, was stormy. We were all hoping that the storms would hold off until after the outdoor wedding. The reception was to be held under the shelter of a massive tent, but the ceremony--the ceremony was to take place in the grand cathedral of the North Carolina mountains, with only the sky overhead. The storms began rolling in as the guests were gathering. It thundered during the prelude. The clouds intensified during the processional and the scripture reading. And sure enough, it began to rain just after the bride's father had given her away. The minister was wonderful, getting straight to the point of the ceremony and keeping things sacred but cheerful. The bride and groom were obviously thrilled just to be there. The parents of the groom were poised and peaceful. The mother of the bride was remarkably composed. But it was the father of the bride who took my breath away. He quietly walked up behind the couple and lifted a white umbrella over their heads. Just after I snapped this photo, umbrellas popped up all around. 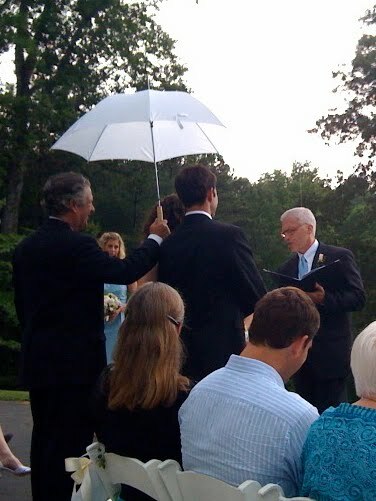 But in this one precious moment, there was just that one umbrella--the one protecting the bride and groom as they stood before the Lord and pledged their lives to one another. Held by the man who was willing to stand in the rain himself in order to shelter his daughter. That is a beautiful picture. Captured at just the right moment. oooh... through teary eyes i am imagining a love so complete. breathtaking... and so beautiful. Breathtaking, indeed. What a precious moment to have witnessed. Thank you for sharing. oh, it's just so sweet. :) Made me all gooey inside. Now you are making me cry :) That is just the sweetest. Reminds me of how God cares for us. What a beautiful moment! Wow, this brought a tear to my eye. What a beatiful picture & such a sweet rememberance of how we should cover & protect those that we love most. So sweet! Such a precious memory for not only the father but also the daughter! I definitely felt the Spirit in your story...just beautiful! Thank you for sharing such a special moment with us all. Wow,this is such a beautiful post. Through tears I can hardly type. I am the mother of 3 daughters, two who have gotten married and the third 'talking' about it right now so this post really touched me. thanks for the wonderful picture and post...now where are those kleenex? God really is the perfect Father, and every now and then we get a glimpse of Him when an earthly father stands in His place. Thank you for sharing. Oohh--your "Tuesdays Unwrapped" posts always tug at my heart strings. :) I hope you'll give the new bride a copy of that photo! What an amazing moment that had to be! Thanks for sharing! Lovely, lovely!! What a perfect and precious moment in time, a wonderful beginning for the two beloved. A very sweet story - I always cry at weddings this one is no exception! That is awesome! I'm so glad you shared this. What a precious moment. A rare and precious moment. How beautiful that you captured it. Wow, Richella. You didn't again. My second visit here and I've got tears again. Guess I'll come for visit more often. Again, Jesus really is the sweetest presence I know. Such a special and sacred moment...can't help but be excited for them. sniff, sniff!!! a true picture of a parent's love!